Flying ahead of the main bomber stream, a Lancaster of 156 Squadron Pathfinder Force makes a run over its target in the heavily defended industrial Ruhr Valley. Extreme concentration can be observed in the crews eyes as they focus on their critical task of marking the target. The Ruhr, the greatest industrial area in the whole of Germany, was the most heavily defended target in the world. The Ruhr Valley was nearly always covered by an almost permanent smoke-haze which, at night made visual pin-pointing of towns below nearly impossible. The Pathfinder force was able to penetrate the industrial pollution with aircraft equipped with the blind-bombing devise known as Oboe. This technology afforded the ability to seek out targets regardless of weather conditions and illuminate desired areas with brilliant target markers which reflected back up from the ground through the haze. 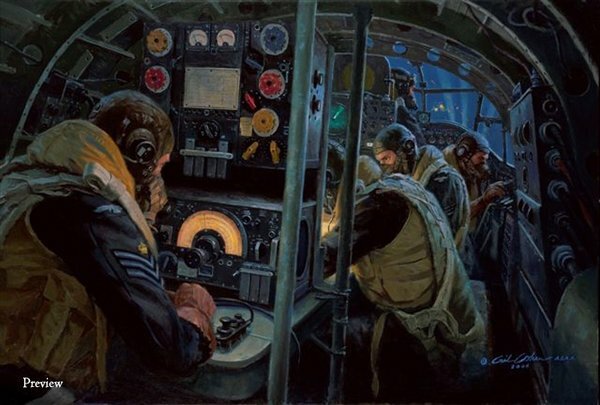 The application of the crews precise identification of the target locations will enable the following bomber strikes to be incisively accurate further crippling the German war effort.